So for three months now, I’ve been struggling to come up with a SPOOC, à la Deborah Chester’s Fantasy Fiction Formula, for Olivyn book 1. This is tres importante, as I’m intending to start the darn thing on November 1st, for this year’s NaNoWriMo project. I have (literally) pages in my notebook of me working, and re-working, and re-re-working, this two-sentence summary. I want to jokingly express my hate for Ms. Chester and her plot formula, except that I can see how important it is, and how it’s forcing me to think things through — to the point where, even after coming up with a reasonably good SPOOC last weekend, I’m already seeing where it won’t sufficiently hold water. (Which is so very, very vexing.) Back to the drawing board. So far I have two eras of kingdom history now actively at odds, a hero, a vision of the future that maybe should be a prophesy instead? Or a legend? An antagonist who is finally telling me his plans (in confidence), but I’m still a little unclear on his endgame. And a heroine who is really going to get put through the ringer, and probably by the end of the book, she’ll want to come over and egg my house. So that’s where I’m at, T minus 20? days, and counting…. I thought about putting a question mark on that title, but I realized it would be rhetorical. I certainly meant to Camp with great vigor this July, but that’s not how it turned out. I’ve done nothing but reduce my project goal. (Bless NaNoWriMo, by the way, for allowing goals to be edited through the end of the month.) I’m still planning to write a short story, but unfortunately (for said story), as soon as I sat down to work on it, I immediately started getting ideas for the first Olivyn book. Which is typical. I’ve been reading about creating magic systems lately — it’s the part of Olivyn that needs the most planning — and one crucial element to work out is the cost of doing magic. Everything comes at a cost (or, TANSTAAFL, for my fellow Heinlein fans), and that includes magical/special powers. If it didn’t, why would it be special? And why wouldn’t everyone use it, all the time? Instead, you see magic where it taxes the user physically. (A lot of magic seems to.) Perhaps there’s blood-letting involved, or the user has to drain life energy of someone, willing or unwilling. (Hart’s Hope comes to mind.) Usually there’s a social/cultural stigma towards magic-users. It might involve valuable objects, or rare materials. It may mark or maim the user’s body over time. It may tie them to a location (Uprooted), or bind them to a kingdom. They may be confronted with laws governing use, user, or both. It may damage them spiritually. (Harry Dresden.) The point is, magic costs you something. Or, at least, it should. Besides the multitude of other bad things about Wizards of the Lost Kingdom, I was struck by how the magic cost both protagonist and antagonist NOTHING. Zero. Zip. In a key moment, the evil-usurper-wizard**, having repeatedly threatened his prisoner (evil?-queen-wizard) by execution, and later, with a knife, turns around to discover her freed, and zap! Vanishes her. If he could do that the whole time, why then and not an hour earlier in the film? And if he can do that at any time, why do we care? There’s no dramatic tension. And the climactic battle between young-boy-king-wizard and evil-usurper-wizard becomes meaningless. Why doesn’t evil-usurper-wizard vanish the kid? Wouldn’t you, y’know, lead with that? Point is, the reader/viewer has to care about what’s happening. A story solely made up of omnipotent characters would get boring pretty quick, as would an impossibly one-sided conflict. If the antagonist can nuke the protagonist on page one, why wouldn’t he? And why would we root for the other guy if he doesn’t stand a chance? The way to make them care is to balance the power (be that magical, mental, weapons, whatever) with costs and consequences. * Most fantasy movies — not all, but MOST — made in the 1980s are deliriously bad. This one raised the bar for “terrible”… yet, somehow, someone thought it did well enough to merit a sequel, Wizards of the Lost Kingdom II (episode 11). Yes. You read that right. They made a SEQUEL of this terrible, terrible movie. Far as I could tell, the sequel is about a teenage wizard discovering girls for the first time. Oh, and magic. I guess. Kind of. ** No, I don’t remember any of the names. This movie is barely watchable with riffing, as background noise while doing something else. I’ve spent the month of May, while not quite as rigorously productive as April, working on research and getting my magic system in order. I’m in the middle of multiple books, honing skills in my weakest areas of writing, and generally trying to set creative habits in my life. And now I have a goal. I feel *nearly* prepared. I’m starting with perhaps the oddest feature of Olivyn — the floating islands — and using the story to explore their origins. I won’t give anything away, but they do not have the kind of occupants one might expect. Are you ready for the summer? I think I’m ready. 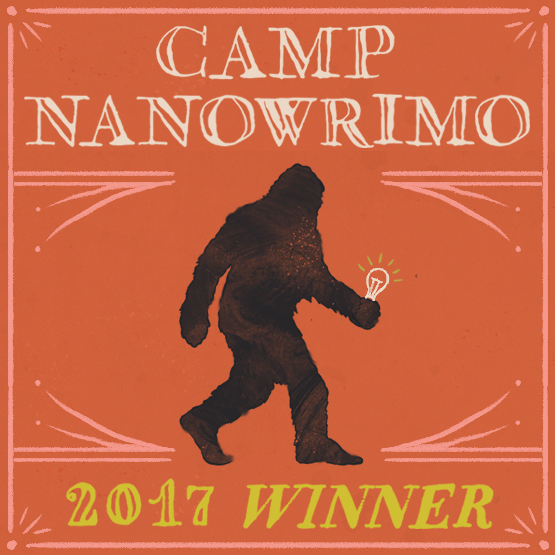 I spent the month of April participating in Camp Nanowrimo, with the goal to get into the habit of writing — or researching, or note-taking, or heck, even thinking about writing — a little each day. It takes 30 days to form a good habit (so I’ve heard.) I had a few days without any time spent, a few days that were insanely productive, and it all averaged out to slightly over 30 minutes per day. Success! So, thus encouraged, I’m back to plinking away at Olivyn, resolving the timeline of historical events, figuring out what characters fit where and when, and developing all aspects of the world. It’s a joy to dive back in. I’m continuing that development for Camp NaNoWriMo this month. And yes, I’m working on all the details, because someone might want them later, and they won’t hurt the readers that don’t need them. If you’re wondering what I’m on about, that’s okay! I hope you like this world I’m building. I promise, no story I write will require in-depth understanding of mineralogy, geology… or any -ology. Stories are built on great characters and plotting, conflict and action. I appreciate hard science fiction, where science and technology take center stage, but I vastly prefer space opera. Gems! Magic! Mayhem! Sky battles! Explosions! World-building adventures with thought-out, geologically-accurate terrain that nobody will ever know nor care about, because it’s really important, okay?? Welcome to the fantasy world of Olivyn!